Purpose: Psychomotor skill is absolutely necessary for endoscopic surgeons. 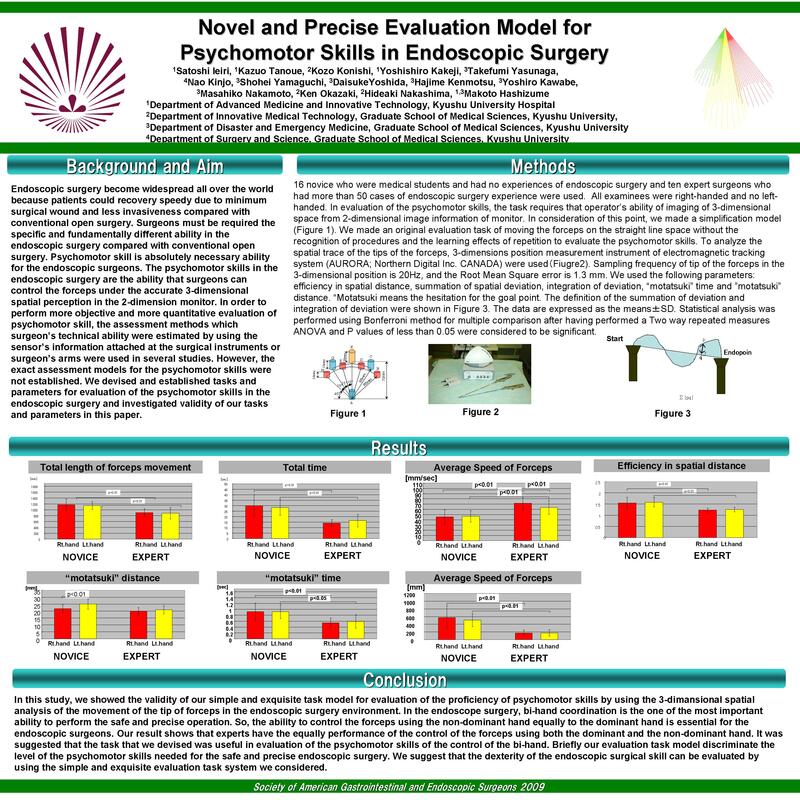 We devised tasks and parameters to evaluate psychomotor skills during endoscopic surgery and investigated their validity. Methods: Sixteen novice medical students (N) and ten expert surgeons (E) whohad performed over 50 endoscopic surgeries participated in the study. We evaluated psychomotor skill by asking the participants to move forceps in a straight-line space. Three-dimensional position measurements of the forcep tips were analyzed with an electromagnetic tracking system (AURORA; Northern Digital Inc. CANADA). The following parameters were evaluated: efficiency of spatial distance, summation of spatial deviation, integration of deviation, motatsuki time, and motatsuki distance. Motatsuki means hesitation in achieving the desired goal point. Data are expressed as mean ± SD. A two-way repeated measure ANOVA and the Bonferroni method for multiple comparisons were used to identify differences at a significance level of p < 0.05. Results: There was no difference in the efficiency of spatial distance with the dominant (right) hand (N, 1.8 } 0.8; E, 1.2 } 0.1) but there was a significant difference (p < 0.001) with the non-dominant (left) hand (N:1.7 } 0.2; E:1.2 } 0.1). The summation spatial distance (mm) between the dominant (N:716.1 } 425.2; E:130.9 } 137.0) and the non-dominant hands (N:579.1 } 176.8; E: 119.7 } 87.4) was significantly different (p < 0.05). Moreover, the integration of spatial distance (mm2) was significantly different (p < 0.01) between the dominant (N:929.9 } 374.8; E:319.9 } 137.0) and non-dominant hands (N:790.2 }141.7; E:258.4 } 102.0). The motatsuki time (s) of the dominant (N:1.1 } 0.4, E:0.5} 0.2, p < 0.05) and non-dominant (N:1.0} 0.2; E:0.6 } 0.3, p < 0.01) hands was significantly different. The motatsuki distance (mm) of the dominant hand (N:25.6 } 4.4; E:19.7} 3.7) was significantly different (p < 0.05) but there was no difference with the non-dominant hand (N:22.4 } 4.0; E:18.4 } 2.1). Conclusions: Our evaluation task model discriminated the level of psychomotor skill required for safe and precise endoscopic surgery. We suggest that the dexterity required for endoscopy can be evaluated using this simple and sensitive testing procedure.